A few years ago, it would have been an indisputable top slot. Even now I maintain it’s (mostly) impeccably structured, beautifully acted and immaculately presented. Few stories were as universally praised, or as talked about in weeks to come. Next to this, even the return of the Master seemed a relatively muted affair. There are two problems with ‘Blink’. In the first instance, it launched a creature that swiftly became a Doctor Who sensation. Like many of Moffat’s creations, it is largely silent. Deaths, such as they are, occur offscreen. They even had their own catchphrase. But the Angels’ appeal lies in their instant familiarity, the everyday made sinister, epitomised in a final montage that’s there purely to scare the kids. If any statue can be an Angel – indeed, if any picture of a statue can be an Angel – then nowhere is safe, and I can’t help thinking that the prospect of being touched by an Angel was enough to keep many a primary school child wide awake for a night or two back in 2007. The big problem, of course, is that once you’ve done that, there’s nowhere for you to go. 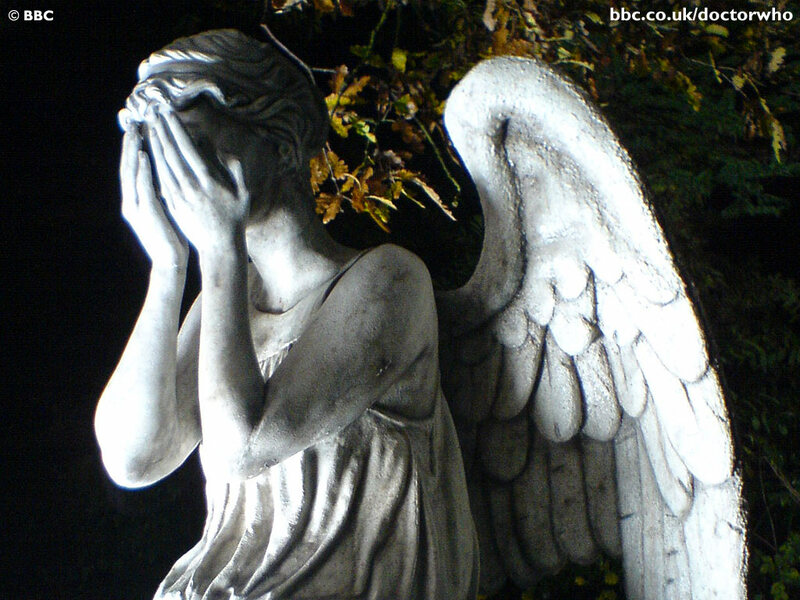 So Moffat branched in a new direction by having the next batch of Angels move, speak and even snap necks. It’s the sort of departure that has the Ninja Turtle fans up in arms, and the fact that comparatively few people seem to have complained about ‘Flesh and Stone’ is down to the fact that at time of broadcast, they were relatively new. 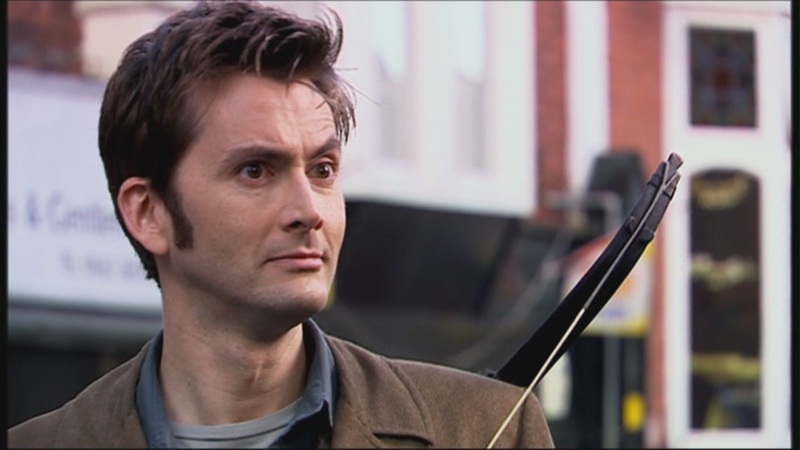 The Tenth Doctor introduces them as “the only psychopaths in the universe to kill you nicely”, but once you’ve done that initial time travel story – and have them try and nick the TARDIS into the bargain – what do you do with them? The fact is that the Angels were one-story monsters, in the same way that the Silence were one-story monsters, the Spoonheads should have been no-story monsters and the Whispermen will probably be the subject of an out-of-court settlement with Joss Whedon. 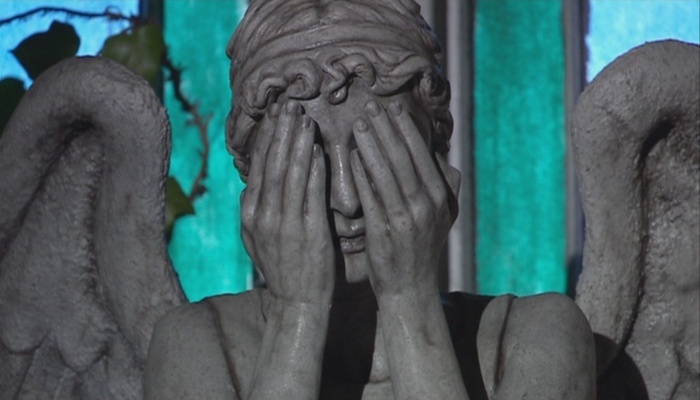 I expanded on all the reasons the Weeping Angels are basically rubbish in a post called, appropriately, ‘Why the Weeping Angels are Rubbish‘ – written before ‘The Angels Take Manhattan’, a story that did nothing to enhance my opinion of them. But it seems churlish to pick on ‘Blink’ because of a less-than-impressive legacy. Better, instead, if we could point out that it’s actually a lot of razzle-dazzle, the problems hiding (for a change) not behind a sea of special effects but instead a whirling dervish of storytelling tricks, pretentiousness dressed up as paradox. And yet the episode only concludes when Sally is able to deal with her obsession with the Doctor and gain narrative closure – a development that enables her, in turn, to gain romantic happiness with Larry. The Doctor is that most metaphorical of ex-boyfriends, or at the very least an internet romance – and while Sally saves the day, her brief narrative arc is ultimately defined by love. Curiously, in 2007 this didn’t bother me. Years later, having Clara flirt with the Eleventh Doctor and then get embroiled in a tedious love story, it does. If I’m being a little harsh today, it’s largely because I’m tired of people talking about the bloody Angels as paragons of brilliance and ‘Blink’ as the ultimate example of clever storytelling. ‘Colony in Space’ is clever storytelling. So is ‘The Face of Evil’. 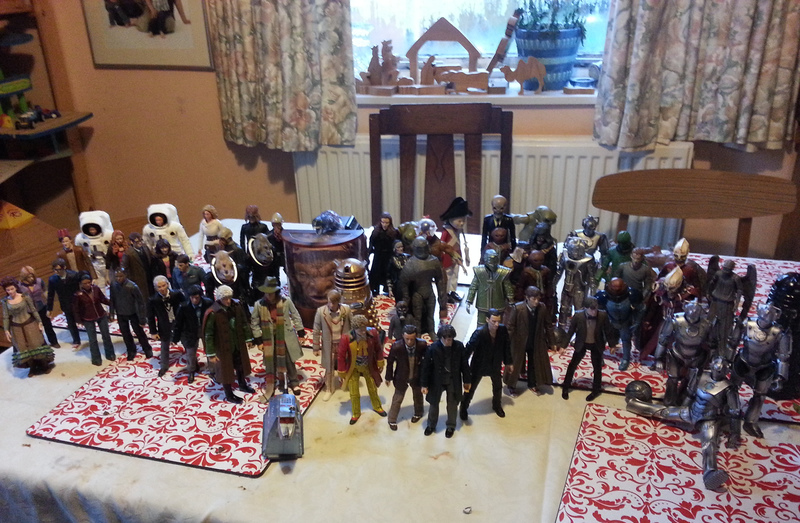 And ‘Remembrance of the Daleks’, come to that. Clever doesn’t mean you tie your audience up in knots. It means you tell a story effectively and with sufficient emotional resonance, and you do not sacrifice narrative trickery for character development. Beware the man who says he can offer you both. More often than not, you’ll end up with neither. At the same time – and I think this might be the reason I continue to hold ‘Blink’ in high regard (despite having spent six paragraphs basically slagging it off) is because in 2007 – after eight episodes of Martha’s fawning and so much kitchen sink at the hands of Rose and the wretched Tylers – it was a bit of a novelty. It is loaded with amusing, memorable dialogue: witness, for example, the incredulous reaction of Larry when he learns about Sally’s miniscule DVD collection, or Sally’s realisation that Kathy lied about her age. 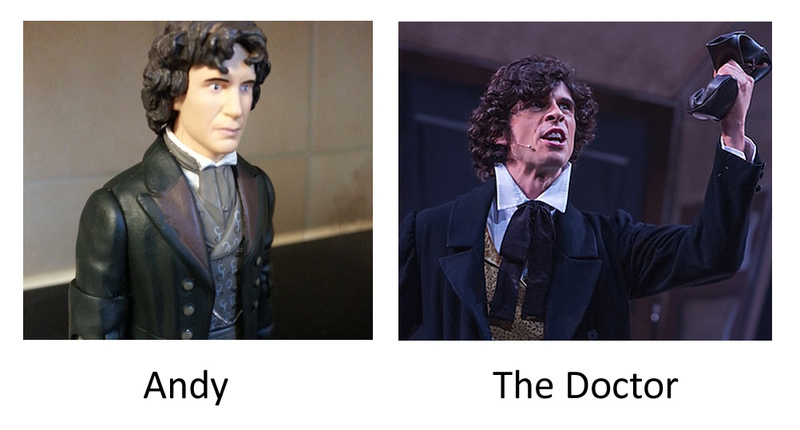 Moffat’s never been one for naturalism, and even when his characters are in a locked room with a ticking bomb they still sound like they’re in an Oscar Wilde play, but it’s hard not to be amused, for example, at Larry’s first impression of Wester Drumlins (“You live in Scooby Doo’s house”) or Sally’s ruminations on feeling sad (“It’s happy for deep people”). Larry is, indeed, an early prototype for Rory, right down to the slightly gormless expression, but that’s not a bad thing. Moffat also manages to tug at the heartstrings during the hospital scene, which remains almost the finest thing he ever wrote (with the exception of Miss Evangelista’s ghosting, in an episode that didn’t make the top ten). If you can live with the ludicrous final line, it’s both moving and comparatively understated, thanks in no small part to some fine performances, particularly Michael Obiora as the elderly Billy. Indeed, one of the best things about the story is the absence of its key players: we do not suffer for the general lack of Doctor, and the fact that Martha turns up only briefly is frankly a welcome bonus. 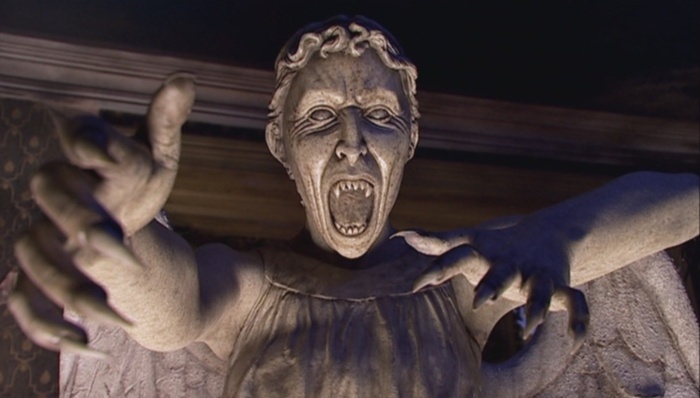 Plus, at its heart, ‘Blink’ is simply terrifying. The moment when the Angels eventually swoop on Sally and Larry, stalking them through the seemingly deserted house, is a fine example of how to do an effective set piece, with appropriate jump cuts and some great use of lighting. 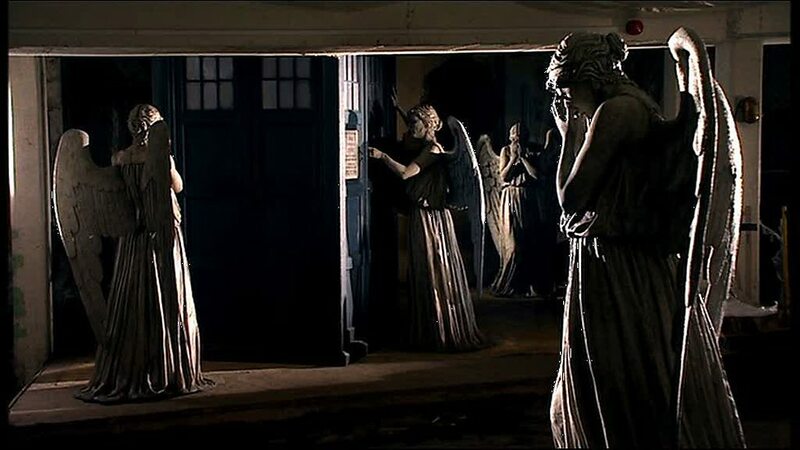 It’s hard not to feel unnerved when the Angels rock the TARDIS back and forth in their attempts to get in, and the moment when it then fades away, leaving them eternally quantum-locked (at least until someone buys up Wester Drumlins and decides to clear out the cellar), is one of initial horror followed by tremendous relief. It works. It works beautifully. It’s about the only time it ever really did, and while that’s not the only reason to single out ‘Blink’ as a miniature masterpiece, it’s certainly a good start. 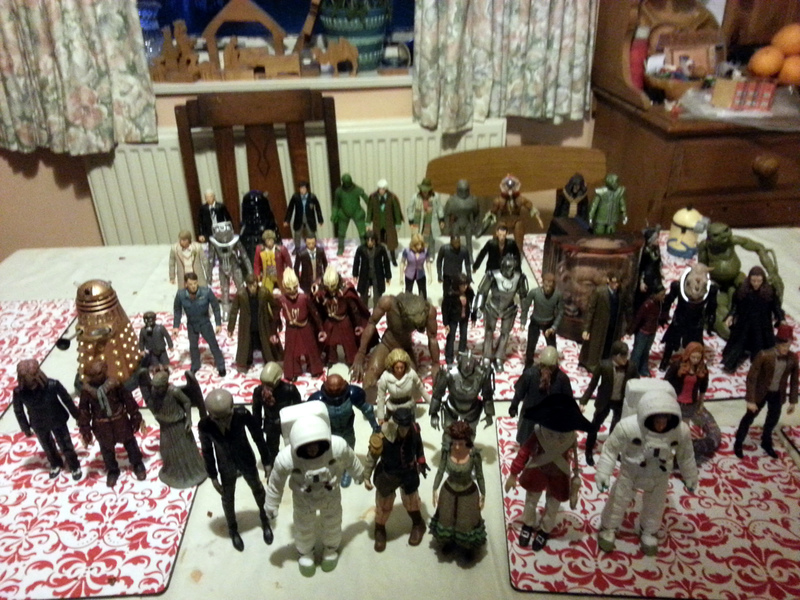 Voyaging tonight into the totally random, here is our Doctor Who figure collection, as at January 2014. The Fez Doctor (there’s a Fez Doctor! THERE’S A FEZ DOCTOR!) 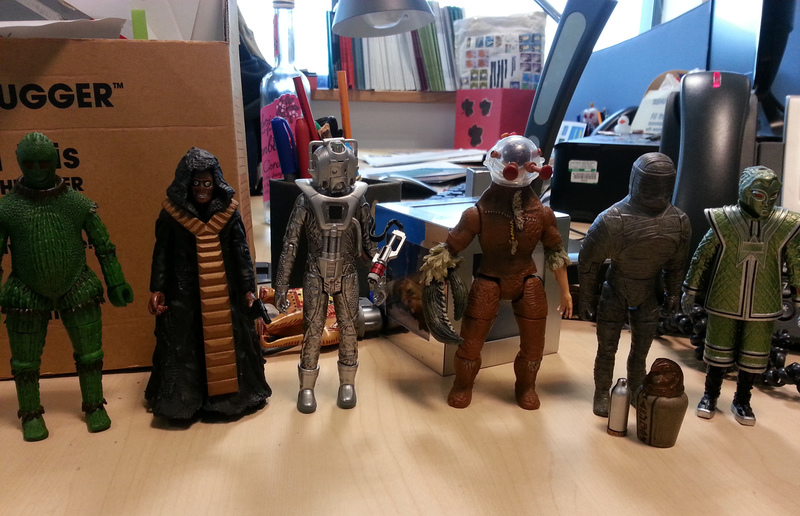 is the most recent addition, but it must be said that I am extremely pleased with this lot – a purchase back in September – even if they did cost me the better part of sixty quid. I was procrastinating the other afternoon when I took this lot, reluctant to start tidying the house after the seasonal maelstrom on the grounds that it’ll become instantly untidy again. 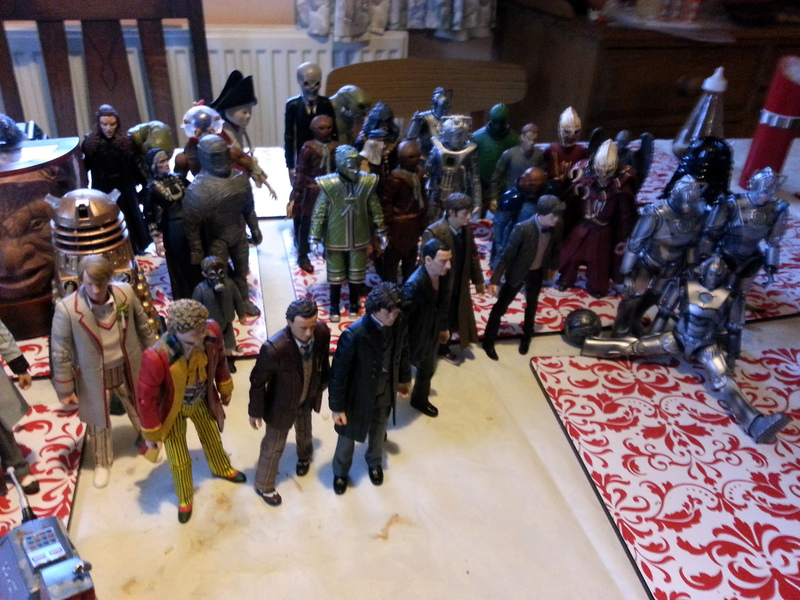 So I spent a good twenty minutes putting the entire collection into chronological order – in other words, the order in which each figure first appeared in the show. Start at the back. And this is my order, which means it’s a bit tenuous. 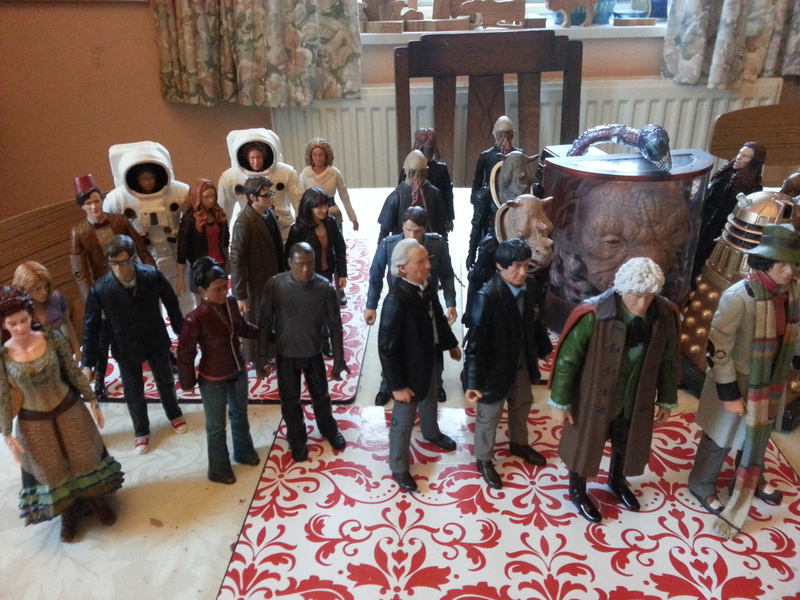 That’s why the middle-aged version of Sarah Jane doesn’t appear until the series two set, while the Dalek placing is all over the shop. And yes, there are probably other mistakes. And no, I’m not doing it again. I have to vacuum. And it’s true, you rarely see them together. She has a point, although it’s not for lack of trying on my part. It doesn’t help that Daniel is notoriously spooked by anything scary, which is reasonable behaviour for a four-year-old. The scene with the doll in ‘Terror of the Autons’ passed more or less without incident, and he even enjoyed the death by plastic chair, but when Pertwee and Manning came face to un-face with those plastic policemen he ran straight out of the room and refused to come back in until UNIT had resolved the situation by doing something useful, which of course took an awfully long time. And, of course, this was the first clip that came up. There followed a series of wails and ear-piercing shrieks and I spent ten minutes trying to calm him down. For a moment or two, it was like ‘Dragonfire’ had never happened and Bonnie Langford was sitting in the front room. 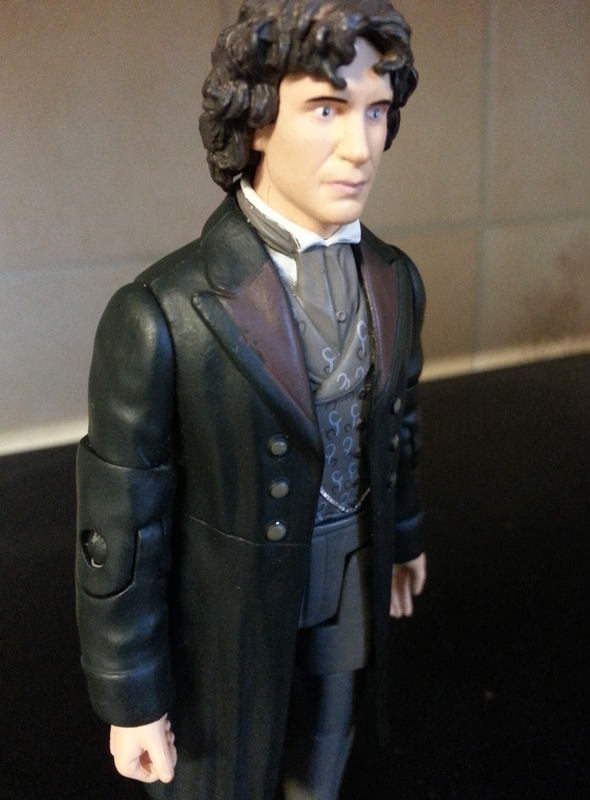 In any event, I pointed out to Sally that any sort of TV indoctrination involving the Eighth Doctor would involve watching Eric Roberts foul up the Master even more than John Simm eventually did, so it’s a fine line to walk. And as much as I’m enjoying this little delve into the past while we wait nine months for Peter Capaldi to start being heroic, I don’t think I’m quite ready for that “half human on my mother’s side” scene just yet. We may just go back to the Master. The real one, I mean. It’s far more fun that way. I thought I’d follow up yesterday’s class excursion into the murky archives of the Central Information Office with another video mashup. If you’ve not yet read the Public Information Films digest, go and do so – or at least watch the last one, right at the bottom of the post hyperlinked above, because otherwise what follows is going to seem even more obscure than usual. Done that? Right, we can move on, and I can show you this. This was Gareth’s idea, and for that I am grateful, because it was a solid concept that took all of an hour to put together, so I call that a win. The toughest part was obtaining a decent quality version of the Doctor’s video that wasn’t hopelessly out of sync, although I’m told it’s a special feature on a DVD I don’t own. After that it was a question of splicing the two and trimming for pacing, right down to the frame. It’s a curious beast, though, because the version you can see above is slightly edited. In my original upload I included a somewhat tacked-on ending, which I still think is funny, but which some people think detracts from the original point. In any case the full version is below (titled ‘better version’ not because of the ending but purely because the timing improves on an earlier cut I’d uploaded), so you can make up your own mind. Just remember to look both ways. You may be aware that I also run a blog called Glurgewatch, aiming to collect together all those sickening images and urban legends that saturate the web. All right – by the web, I actually mean Facebook. That seems to have become the place where the glurge gathers. An awful lot of conscience-easing takes place on Facebook: it’s a quick and lazy way of sharing trivial information about your life, and a quick and lazy way of showing that you ‘care’ about Stuff That Matters. For example, a group was set up last week (and sorry, I can’t find a link, but trust me on this) to register support for the family of a missing five-year-old, where the only rule was to give your name and current location as a gesture that you were thinking about them. At the other end of the spectrum of love, a twenty-year-old man has been jailed for being offensive, but predominantly stupid. Upon superficial examination, the Matthew Wood thing is sickening, and the April Jones support group heartfelt and well-meant. But it’s never that simple. Matthew Wood was an eejit and I’m not about to debate the merits of free speech versus the responsibility to keep your mouth shut if what you have to say is so vehemently nasty (irrespective of whether or not he was joking, there’s a time and a place – at the same time, the support group is really just a way of generating Facebook traffic and reaching an obscene amount of comments and likes simply because you can. I don’t care what the organisers say; there is basically no merit in it whatsoever. It doesn’t find the girl. There are official groups for that, and I don’t know how far they’ve got. This is just something you can conveniently share as a status update that allows you to pay lip service for causes that you actually care about far less than who may have fixed this week’s X-Factor. The petition-signing / armchair justice-advocating / virtual candle-lighting charade has no real purpose; it merely allows us all to further harbour the delusion that there’s any kind of mass community on Facebook, when really it’s only ever been about pockets and hubs. It’s stuff for people who want to say they care without actually doing anything, which is perhaps worse than simply not caring at all. Anyway, this clicktivism irritates the hell out of me, because I have never understood the point of plastering photos of disabled children all over my timeline in order to remind people that disabled children exist and that we shouldn’t stare at them. Nor do I comprehend why I should be emotionally blackmailed into copy-and-pasting a status about cancer / welfare / mental illness, with the implication that any refusal on my part would be taken as a sign that I didn’t care about the issue in question. You know the sort: “If you don’t post this photo of a girl with only one arm and a cleft palate, it means you kill puppies, eat babies and HAVE NO SOUL”. I have good friends who insist on wallowing in the cesspit of such inanity, and I can never figure out why, but my real gripe is with the idiots who actually start them going in the first place. I’m a fairly tolerant sort, by the standards of your average centre-left Englishman – but seriously, the people who come up with this garbage should have to shampoo my crotch. Anyway, I am doing my own. First of all, there was the chicken. Then, just the other day, I did this. And within twenty minutes of that going on my wall, Gareth had created this. The Guardian has revealed that the new companion will be <spoiler> and that <spoiler>. And also <spoiler>. And, in episode <spoiler>, we’ll see <spoiler>. Oh, what’s the point? I don’t want to tell you about it because I don’t want you to make the same mistake I did, which is to read the damned thing and encounter a WHOPPING GREAT REVELATION by the writer-in-chief. The Guardian didn’t really signpost this effectively – there was a little information at the top, but far more was revealed therein than I’d have liked to know. At the same time, the real focus of my ire is Moffat himself, because he’s really starting to piss me off these days. The writing style is brilliant, I’m not going to deny it, although I take issue with some of his plot arcs (more on that below). There are some fantastic one liners and some genuinely moving moments (the ghosting in ‘Silence in the Library’ still gives me the shivers), and the way he weaves technology and emotional involvement into a cohesive whole is reminiscent of 1980s anime. At the same time, he annoys me, because he’ll rant about spoilers on TV A.M. (or whatever it is they call it now; ye gods I’m showing my age) and then tell us everything himself. And if he must insist on courting the press, he has to accept the consequences. Unless you want to make it illegal to disclose such information, you have to deal with the fact that people are going to tell all, and not get cross when it leaks out, and taking to the internet to complain with his customary self-righteous arrogance. I am aware that I am ranting a bit. 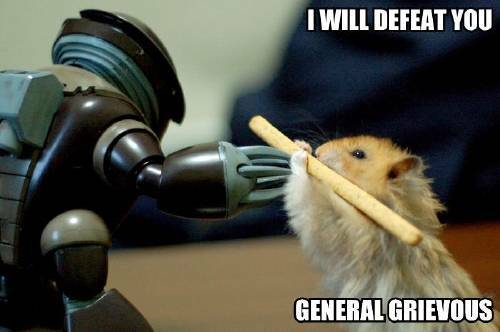 Because I don’t want to depress you, and because I don’t want to include anything of the new companion just yet, here’s a picture of a hamster. Joshua and I were watching ‘Blink’ last night – as you probably gathered from my previous entry – and I was reflecting this morning what a tightly focussed, brilliant little episode it is. 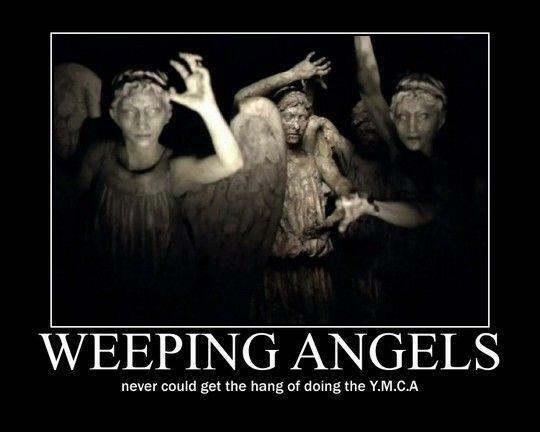 The Weeping Angels, back when they were fresh and innovative and when they actually worked, because as interesting as ‘The Time of Angels’ was, it showed up the inadequacies of the Angels when you put them in an inappropriate setting, multiply them tenfold and then, unforgivably, have them move. Moffat can write good, continuous drama – Press Gang, Jekyll – but as a Who writer his best work has been standalone (and if River Song’s involvement with the show had ended with ‘Forest of the Dead’, I’d have liked her a lot more). The central problem with the way the show is constructed these days that the ontological Ouroboros paradoxes work well in the context of single episodes, but break down when Moffat tries to make them fit over entire seasons, or even half seasons. The big bang / universe reboot that closed season five was an absurd piece of handwavium, the River story has devolved into mind-numbing tedium, and the charade that was the Doctor’s ‘death’ and the mirror universe built around it was so badly constructed it almost made ‘Last of the Time Lords’ work in comparison. I thus equate Moffat with Kate Bush during recording of The Dreaming. She’d just got a Fairlight, and she completely saturated the album with it. The result is a very full texture crammed with different ideas and innovations and experiments. And not all of it works. There’s some whopping clangers on there and a few moments of beauty. It’s a better album than it’s given credit for, because it tends to live in the shadow of Hounds of Love (which follows it and which she never bettered). But it was basically a kid who was given complete control and who went a bit wild. And that’s how I see Moffat. Just a big kid who’s been given charge of something and wants to bring his standalone technique to a show that really doesn’t suit it. This isn’t the Black Guardian trilogy. It’s a mess. I have, in any event, figured out what that crack in the universe actually was. It isn’t the TARDIS exploding. It’s the chief writer, stretching a literary conceit to fracturing point. 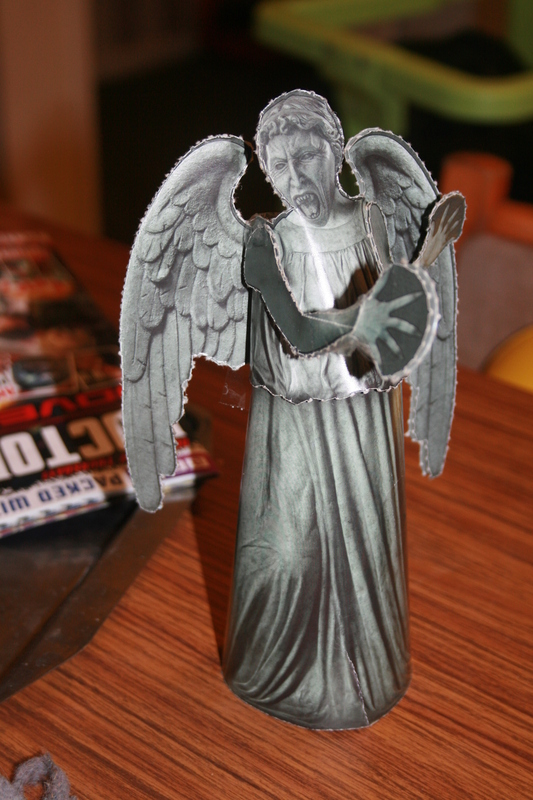 Made this with the help of Joshua, courtesy of Doctor Who Adventures. Emily and I are currently in discussions as to whether or not it is a suitable adornment for the top of the Christmas tree. I think it is. Emily is not so keen. I have a feeling she will win.